If you are interested in building your own electric motorcycle, you have come to the right place! I’m working on posting all the information on how I built my own electric motorcycle to share with your. If you are ready to jump right in to building your own, please check out my BUILD YOUR OWN ELECTRIC MOTORCYCLE instructional DVD set! Here’s a teaser video to get you going. My electric motorcycle conversion DVD is now available IN FULL, for FREE on YouTube. Watch the PLAYLIST HERE. For “Chapters” of how I built the cycle, please see the links on the sidebar, or click the links below. I’m currently going through and adding in all the details to this project. Don’t worry if all the detailed info isn’t there yet, I’m going to keep adding to it! The Briggs & Stratton Etek motor is rated at 150 amps continuous, and rates as a 8 – 12 HP motor, depending on voltage. With my 300 amp controller, and 48V of batteries, that comes to about 20 HP peak, which you get INSTANTLY from an electric motor. If I swapped out the inexpensive drive sprocket ($10 at the Farm & Fleet store) I could probably go 60 or 65 mph and still be within the amperage rating of the motor, although I wouldn’t have as good acceleration. The cycle goes 20-30 miles per charge, depending on speed, weather, hills, etc. on 4 Optima Yellow-Top batteries. It charges overnight with a built-in 48V charger. I’ve also charged it directly from a 48V 400 watt solar panel. Here’s a video of my friend testing the cycle in the parking lot after updating some work on it. I’ve searched around for a decent, used sport bike with good frame volume for numerous batteries, and I think I’ve found something worthwhile. 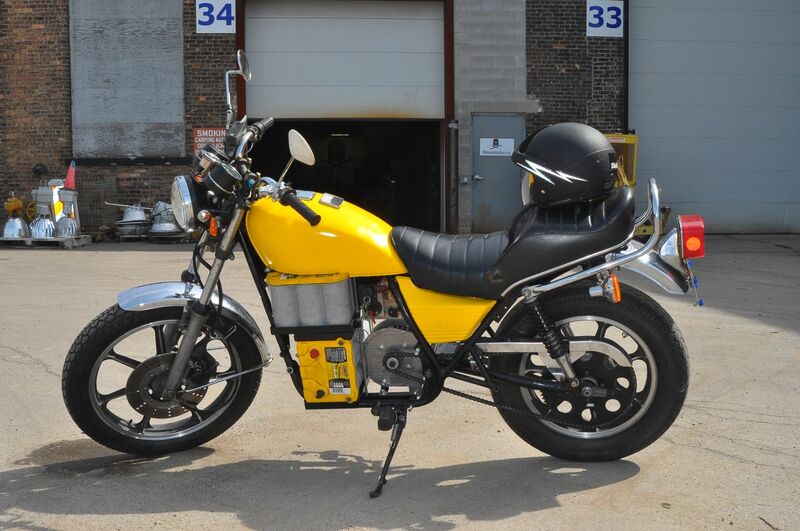 I hope to pull the trigger on my e-cycle project soon. I still wonder (after searching for a while), why don’t e-cycles use transmissions? As far as I can see, e-cars use transmissions, so why not e-cycles? On an electric motorcycle, there’s just a single drive wheel, so no need for a differential, and the chain and two different size sprockets take care of the gearing. I had a similar question re. Transmissions. On many of the YouTube vids I’ve watched on homemade ev’s, especially the ones made from Volkswagen bugs, they still keep the manual transmission. I remember one guy saying that he kept it purely for the driving experience, but I also thought that the transmission would help to extend the possible range from a charge. If this is the case (as I’m not sure), wouldn’t it make sense to use the gearbox on an ev bike? A transmission on a typical home converted EV front-wheel drive car is generally kept for two reasons; 1: Gear Reduction 2: Differential. On an EV motorcycle, you don’t need a differential (because there is only one drive wheel anyways,) and the gearing can be changed between the motor and rear wheel by changing either or both of the sprockets. On most motorcycles, the transmission is built right together with the engine. It’s hard to remove the engine, and still have an independent, working transmission. Plus, the transmission takes up valuable space that could be used for batteries. Having a transmission will NOT extend the range of the EV. Transmissions are designed for giving you higher speeds at particular RPM band. As for driving experience, I do know of one electric motorcycle manufacturer that does have a traditional manual transmission on their high-end cycle, and it IS there to make it feel more like a typical gas motorcycle. Very cool. I am very interested in the process of converting a motorcycle into an electric motorcycle. Hey ! How you doing? I too am more than keen on building my own electric motorcycle. The thing is that I am unable to determine it’s components that are required for the ‘specs’ I have in my mind. The bike I want to build should go 30-45 miles per chargeand should reach speeds 30-35 mph. The reason for this is I need the motorcycle to travel to my college and back home, the entire distance travelled would be 53-55 KM. I think that using batteries with high power output and a high RPM DC motor can do the trick and if it really the solution i just don’t know exactly which motor or which battery should I go for? I searched the web but found no credible answer. Since you actually built the thing I thought you will know what I need to know. So please HELP me out here! I cover all this in my BUILD YOUR OWN ELECTRIC MOTORCYCLE DVD. Range is mostly about battery pack capacity. For example, my cycle uses four 55AH capacity batteries in series for a 48V system. 55AH times 48V is 2640 watt-hours. Figuring a guesstimated energy use of 100 watt-hours per mile (2640/100=26.4) comes to about 26 miles of range, which is more or less what I came to in real-world testing. So, if you want to go 30-45 miles per charge, you just need a battery pack that is roughly double the capacity of the one I am using. Frankly, that’s pushing what’s reasonable to do with lead acid batteries. A 5kWh battery pack should be plenty for you. As for motors, there’s all sorts of different types that will work. Motenergy has a series of motors that are well-suited for EV motorcycles. If I were to build an EV cycle from scratch right now, I would use a 72V motor and controller and lithium battery pack. Sounds like a round-a-bout way of creating a serial hybrid. While possible to do, I doubt it would be the best way to go. Using gas to spin an alternator to make electricity to spin an electric motor really isn’t advantageous over just using a gas engine to spin the wheel directly. All those extra steps in there are losses that would make it LESS efficient. The way to make it MORE efficient would be to use an engine and generator that are really sized/geared for each other and keeps the generator engine running at peak efficiency. Typically the other way that serial hybrids are used is that they START with an EV only mode, using a battery pack, charged from the wall, and then the engine is used as a range extender after the range of the battery is used up. Imagine the way a Chevy Volt works – it’s VERY efficient to start with as an EV for the first 40 miles, after that, it runs on gas, but the fuel economy in that mode is NOT exceptional. The other thing is that scooters and motorcycles are relatively small vehicles. It’s hard to cram in all the extra components to fit inside the bike. Another option would be to use (or convert) an electric motorcycle/scooter and then add a trailer or sidecar (which would be removable.) A generator could be mounted in that. The other thing to consider is simply to make aerodynamic improvements to cycles. Do a web search for the aerodynamic improvements that Craig Vetter has been making to some 250cc scooters. It’s pretty impressive work. Would you mind telling us what your overall budget was, with and without the donor bike? I’ve watched almost all the videos and read most everything from your build, so I apologize if I’m asking something you did cover and I just missed it. This build seems like a really good use of some reliable and easily accessible parts, but I have seen one or two that are faster, go farther, and are probably much more technical. One that comes to mind has cost its maker well over $10,000 over all of its experiments and tweaks. I certainly have no interest in getting near that mark, but I’d like your number to compare it to, if you don’t mind. Thanks a mint. You’ve done something really awesome here. The entire motorcycle project was right around $2,000. I’ve seen people build EV Motorcycle conversions anywhere from free for parts they got from work to $10,000. The typical cost will be somewhere in between.